It is important to consider noise output at the first stage because if your gaming PC also needs to be as quiet as possible it is important to choose the right components. You CAN NOT have a silent extreme gaming PC but you can reduce the noise to a very large extent by choosing the case, the case fans, the power supply, the CPU heatsink and graphics cards very carefully. Simple rule of thumb is the more fans you have the higher the noise output. With an extreme gaming PC you will have lots of fans. There will be one in the PSU, one or two on the CPU heatsink, 2 to 7 case fans and the graphics card fans. 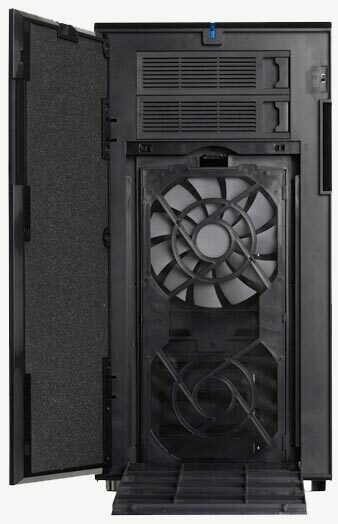 Selecting a case which has plenty of cooling but also has some noise dampening features (for example the Fractal Design Define R4 or Antec P183 or Corsair Obsidian S550D case), will reduce noise output. Smaller fans have to spin faster to provide the same amount of cooling. So choosing a power supply with a quiet large fan is a good idea. Similarly larger case fans will provide lots of cooling but will be a lot quieter than smaller case fans. Selecting quieter case fans like those made by Fractal Design or Zalman or Reeven will reduce the noise even further. A quieter CPU heatsink and fan combo and choosing a lower overclock on the CPU will also help to make the PC quieter. Solid state drives have no moving parts so they are completely silent. Choosing an SSD as the primary drive will mean eliminating hard drive noise completely during ordinary operations. As for graphics cards, it is very difficult to get high end graphics cards which are quiet. Most standard design gaming cards tend to have only one small fan when they are first introduced. These tend to be very noisy under load. Eventually manufacturers release versions with 2 or more fans. Graphics cards get very hot under load and if there is only 1 small fan it needs to spin very fast to keep the card cool. Due to the small height of graphics cards it is not possible to fit very big fans on them, so the solution is to have 2 or 3 fans. With multiple fans each of these fans don’t need to spin as fast as when there is only one fan and this means the total noise output is reduced. Therefore these multi-fan versions are a lot quieter than the standard graphics cards but will still be the noisiest component in the PC when they are put under load.